The latest release of our NetAdvantage product has been truly feature rich. For 11.2 the XamGrid was made available for WPF and with that it joined the team of XAML Cross-platform controls. 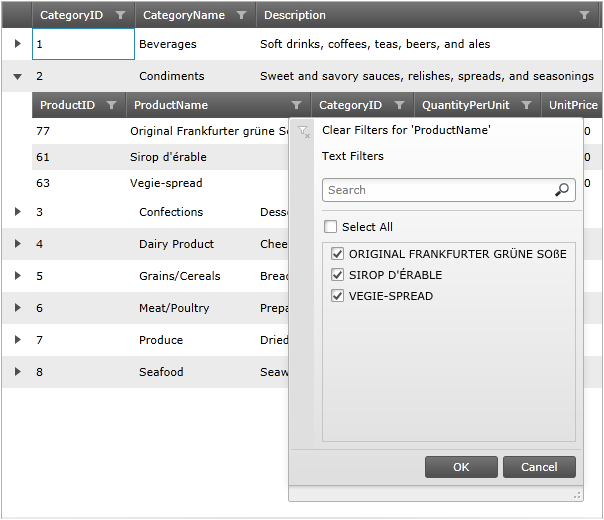 But it also received many improvements, one of those is a new exciting feature related with filtering – a Filter Menu. The main goal is of course much more user friendly filtering interface as many users are familiar with how Excel Filtering works. This new filtering option would not only make users more confortable but it also brings a lot of functionality in terms of what kind of filters can be used and how complicated search can the end-user perform and in this article we will take the time to look into those. So far the XamGrid offered only a filter row at its top or bottom. That one is not going away and when enabling filtering you will have to chose which mode to use. So what do you get and loose? So by using the menu mode you would save vertical space for one row but as you can see unless instructed otherwise the grid will increase the width of the columns to fit the icon. The filter row does have an advantage too as it would let you see the currently active filter while the changed filter menu’s icon would be the only indication there’s a filter active on that column. Just as expected it is available for child columns and that is another row of space saved for every level of hierarchy in the data. Being compact is not even the strength of this feature to begin with. An intuitive and inviting UI the menu also provides (as seen above) plenty of extra functionality – it will display a list with all available items and provide the user with a search field and an easy “Select All” checkbox that can be used to quickly add or even remove items. The menu has a handle on the right lower corner that can be dragged to resize it when dealing with lengthy items in large sets to reduce scrolling. So far you might be asking where did the good old “greater than” and “ends with” filter options go – and not to worry they are all available just under the clear option in a separate menu node or as can be seen as ‘Text/Date Filters’ above. 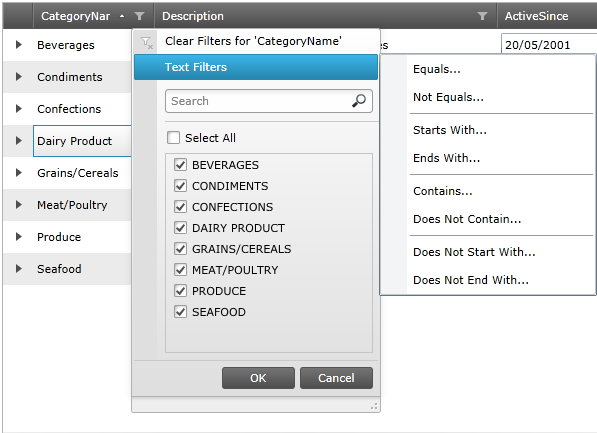 As expected from a smart filter menu those would be presented to the user based on the type of data in the column. All will provide the basic Equal/Not Equal options. 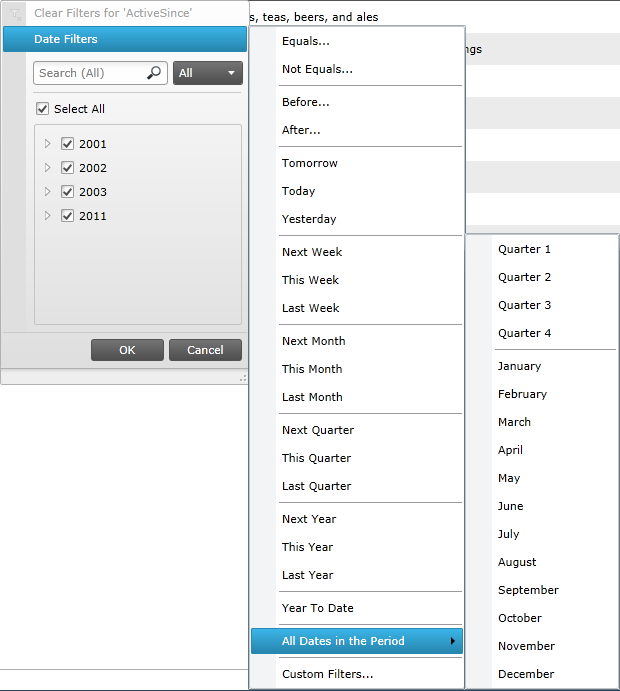 And the options for a column containing dates are simply overwhelming! 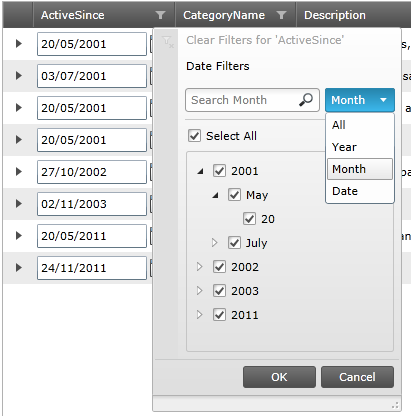 Including things like viewing data from today or this week/year, picking a specific month or even a quarter – the list goes on. Click on the thumbnail to see for yourself. More complicated filters more readily! 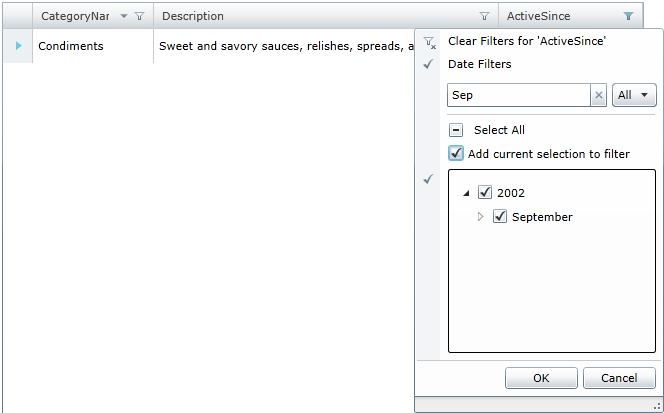 Do note that the option on top of every menu so far states “filters”. 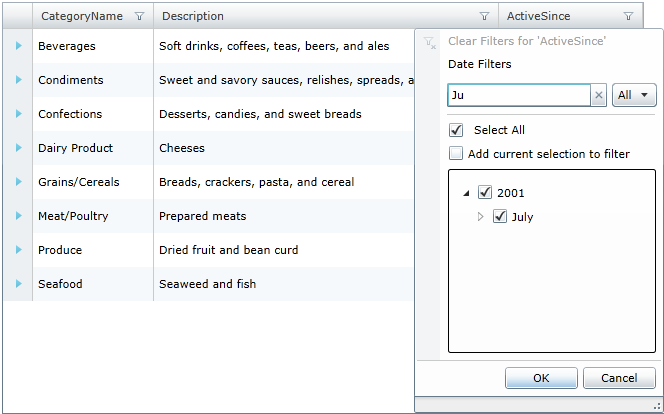 What that means is the Filter Menu can provide even better filtering while allowing multiple filters to be active. Imagine hundreds of thousands rows of data and then imagine trying to filter them melts the data down to just under a thousand. Too much? Well luckily you can filter the filter results! 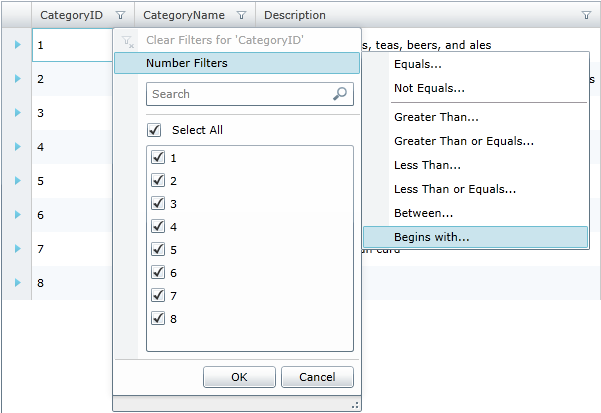 Or the data required can’t be described with a single filter? Two or more simultaneously would do. Here’s a small example begging with a user wishing to view products launched in July. But also in September. Not a problem one more filtering won’t solve. And when combining filters isn’t easy and fast enough, time and effort can be saved by creating a custom filter of your own. You have the ability to provide the logic (strongly typed lambda expression) used to filter, a name and even icon for your filter and choose if it requires user input or not. Here’s a sample code for filter named “Sweets” that does not require input and returns all rows that have ‘sweet’ in their description. The filter is then added to the filter row (more on that below) and the filter menu when the XamGrid is loaded in the appropriate event. 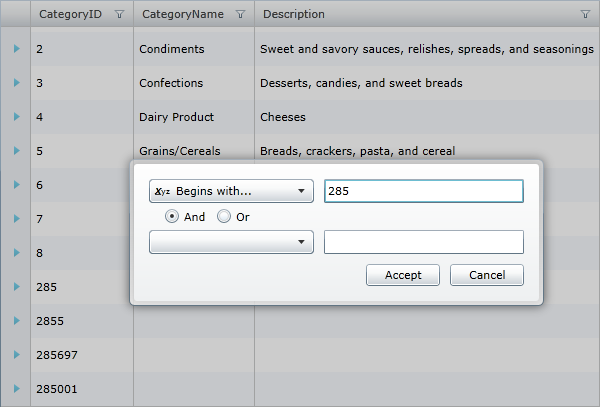 The user will see a new option in the menu and in this example there are only two rows that contain ‘sweet’ and they will be the only ones left right after choosing the option. 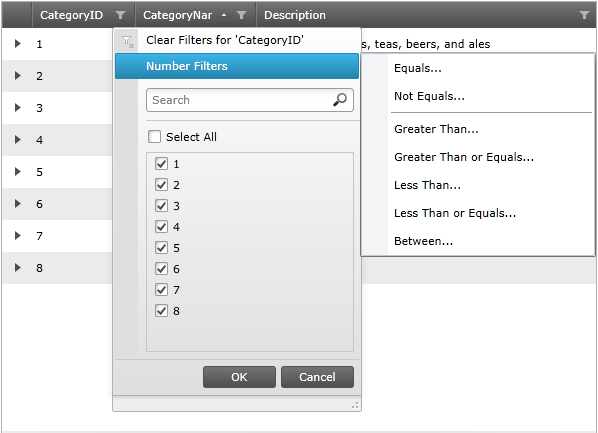 The XamGrid Filter Menu comes with many benefits. It will appeal to both Excel users and NetAdvantage for WPF XamDataGrid user offering familiar interface. Enhanced user experience that doesn’t sacrifice functionality, quite the contrary – it adds easier ways to get just the relevant data,comes with a lot of predefined options, allows the user to combine filters for greater results and the developer to add and improve it even more. Try out the live demo on our samples page. Or download a demo with all mentioned in this article from here. The demo project has XamGrid with enabled editing and row adding so you can tweak the data to be filtered to your liking and has been cleaned so make sure the references are in place and build.